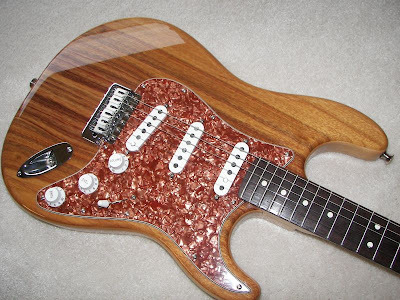 I stumbled upon Ralph and Sandy's Custom Shop on eBay, and though that's a pretty laid back name, Ralph and Sandy have a large gallery of beautiful work and an even larger stack of satisfied customer comments. Our featured instrument reminds me of root beer. They specialize in vintage restorations, custom work and hi-end select new guitars. Yes, they relic too, but seem to recognize that some people still appreciate clean flawlessly finished guitars. I don't have any specs on our featured photo model. It's just one of the many pics displayed. Tele's represent the majority, but you'll see plenty of Stratoliciousness too!